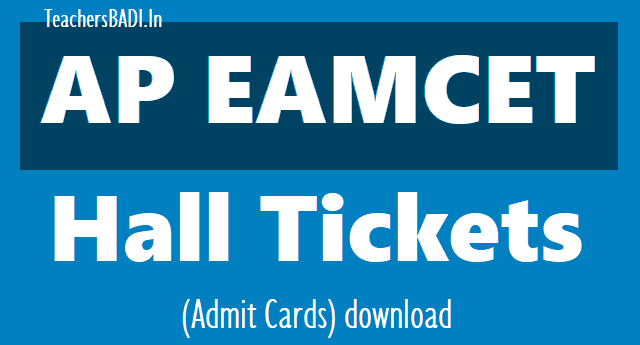 AP EAMCET 2019 hall tickets download: Engineering, Agriculture and Medical Common Entrance Test (EAMCET) is conducted by Jawaharlal Nehru Technological University Kakinada on behalf of APSCHE. This examination is the prerequisite for admission into various professional courses offered in University/ Private Colleges in the state of Andhra Pradesh. JNTU, Kakinada issued the AP EAMCET 2019 Notification on 8th, February 2019 and the JNT University invited the Online Applications from the Eligible students for admission into various engineering medicine and agricultural courses through EAMCET 2019 from 20-02-2019 to 27-03-2019. Applied students are waiting for their hall tickets. So, candidates can download their hall tickets from 16-04-2019. AP EAMCET 2019 Exam would be conducted as below given schedule. The AP EAMCET 2019 will be conducted by the Jawaharlal Nehru Technological University (JNTU), Kakinada on behalf of APSCHE. The Hall ticket for the AP EAMCET 2019 will be released today, on April 15, 2019 on the official website, sche.ap.gov.in/eamcet. Candidates who will be appearing for the examination can now download the Hall tickets directly through the official website. As per the information, the AP EAMCET 2019 examination will be conducted from April 20 to 23, 2019. The AP EAMCET 2019 will be conducted by the Jawaharlal Nehru Technological University (JNTU), Kakinada on behalf of APSCHE for admission into various professional courses offered in university/private colleges in Andhra Pradesh. The exam will be conducted in an online mode in two sessions from 10 am to 1 pm and 2:30 pm to 5:30 pm. Candidates need to secure at least 25 per cent of the maximum marks in order to clear the examination. The AP Eamcet for admission into engineering, agricultural and non-medical courses will be held at 140 centres including Hyderabad.The test will be held on April 20.04.2019, 21.04.2019, 22.04.2019 & 23.04.2019 for engineering and April 23.04.2019 & 24.04.2019 for agriculture students. The test will be totally online this year. Students can opt for five or six centres, and will be allotted to one. Students cannot opt for a date or time for the test. The centre, date and time would be allotted by the Eamcet office. A student who skips the allotted slot would not be allowed to take the exam the next day. Kurnool has been allotted a centre for students who want Urdu translation. In Hyderabad, the test will be held in Moulali, Nacharam and Hayatnagar. Andhra Pradesh Engineering, Agriculture and Medical Common Entrance Test (AP EAMCET) 2019 hall tickets are available in the official website of AP EAMCET. AP EAMCET is conducted by Jawaharlal Nehru Technological University (JNTU) Kakinada on behalf of Andhra Pradesh State Council of Higher Education (APSCHE). AP EAMCET is the prerequisite for admission into various professional courses offered in University and Private Colleges in the state of Andhra Pradesh. The hall ticket / admit card are available to download for the candidates who have registered for the exam. Hall tickets for APEAMCET-2019 are enabled from 16th April 2019 afternoon. AP EAMCET Engineering Examination will be conducted on April 20.04.2019, 21.04.2019, 22.04.2019 & 23.04.2019 and AP EAMCET Agriculture Examination will be conducted on April 23.04.2019 & 24.04.2019 The examination grants admission into various professional courses offered in University and Private colleges across the State of Andhra Pradesh. APSCHE has given the responsibility of conducting the prestigious Entrance Examination of the State "APEAMCET-2019" to JNTUK for the first time after reorganization of the State of Andhra Pradesh. a. Hall ticket issued to the candidate is an important document. Candidates are required to preserve it carefully. b. Hall ticket is not transferable. Any tampering of Hall Ticket will automatically lead to the disqualification of the candidate. c. Candidate shall arrive at the examination hall atleast half an hour before commencement of the examination. This will enable the candidate to familiarize himself/herself with the OMR Answer Sheet. d. Candidates will not be allowed to enter examination hall once the examination has commenced. e. Candidates are permitted to use Blue / Black Ball Point Pen only. i) Hall Ticket ii) good Ball Point Pens (Blue or Black) iii) Filled in Online Application Form and iv) Attested copy of the Caste certificate (in case of SC/ST category candidates only). g. Besides the items listed in Serial No. (2.f) above, the candidate should not bring any other material. This instruction sheet also should not be brought into the examination hall. Candidates should not bring Log books, Tables, Calculators, Pagers, Cell Phones etc., into the examination hall. Any candidate found in possession of any forbidden material will be sent out of the examination hall. h. Candidate shall first fill in the details concerning the Question Paper Booklet Number and Booklet Code on the OMR Answer Sheet as well as Nominal Roll. The candidate shall read carefully the instructions before he/she starts answering the questions. i. Candidates must remain seated in their allotted places till the completion of the examination. In no case they will be allowed to leave the examination hall till the end of the examination. Before leaving the examination hall, the candidates must ensure to return the OMR Answer Sheet to the Invigilator. Candidate is permitted to leave the examination hall only when the Invigilator satisfies with the complete receipt of OMR Answer Sheets and allow the candidates to leave the hall. The candidate will be permitted to carry the Question Paper Booklet along with them after the completion of examination. j. Every candidate appearing for AP EAMCET 2019 shall be provided with a specially designed Optical Mark Reader (OMR) response sheet (Answer Sheet), on which the candidate shall have to mark his or her answers and other relevant data. The method of marking the answers is illustrated in this section. Candidates are advised to go through the instructions given for marking the answers and other entries on the Optical Mark Reader (OMR) Answer Sheet thoroughly and practice the same at their residence which should make it easy for them to answer in the examination hall. k. The Optical Mark Reader (OMR) Answer Sheet should be handled carefully by the candidates. They are advised not to fold, wrinkle or tear the answer sheet under any circumstances. Further, the candidates are advised not to scribble or make any marks on the answer sheet except marking the answers and other relevant data at appropriate places on the answer sheet. Any violation of these instructions will automatically lead to the disqualification of the candidate. l. i) Candidate shall note that under any circumstances they will not be given a second blank Optical Mark Reader (OMR) answer sheet. Hence, they are advised to be careful in handling their answer sheet. ii) In AP EAMCET – 2019, the Candidate Name, Hall Ticket Number and Photograph are printed by the Convener on OMR answer sheet as per the data provided by the candidate. Candidate shall ensure that whether he/she received his/her own OMR answer sheet or not. If there is any discrepancy in details or damage to the sheet, the same shall be brought to the notice of the Invigilator immediately. m. The Question Paper Booklet given to the candidate shall consist of 160 questions (multiple choice type) in three different sections subject wise with four responses given to each question out of which only one response is correct for the given question. Candidates shall mark the correct answer in the Optical Mark Reader (OMR) answer sheet by shading in Dark the appropriate circle with Blue / Black Ball Point Pen. n. Candidates are required to answer all the questions. All questions carry equal marks. There is no negative mark for incorrect answer. AP EAMCET Admit Cards 2019: The admit card for the AP Eamcet examination will be declared tomorrow, April 18. The candidates who are appearing for the examinations can download the admit card from the official website, sche.ap.gov.in/eamcet. The examination will be held from April 22 to April 25, 2019. The exam is conducted by Jawaharlal Nehru Technological University (JNTU), Kakinada on behalf of APSCHE for admission into various professional courses offered in university/private colleges in the state of Andhra Pradesh. It is a computer based test. Aspirants can also check out mock tests available on the website – sche.ap.gov.in. The exam will be conducted in two sessions – from 10 am to 1 pm and 2:30 pm to 5:30 pm. The qualifying percentage of marks for the AP EAMCET-2019 is 25 per cent of the maximum marks considered for ranking. Andhra Pradesh State Council of Higher Education (APSCHE) has entrusted the task of conducting the prestigious entrance examination of the state "AP EAMCET" to JNTUK for the first time after reorganization of the state of Andhra Pradesh. The APSCHE has instilled confidence and faith in JNTUK for the smooth conduct of the AP EAMCET for two times (2015 & 2016) in offline mode and two times (2017 & 2018) in online mode in the state of Andhra Pradesh.